Edinburgh is a wonderfully vibrant city, full of interesting and amazing things to see and do. 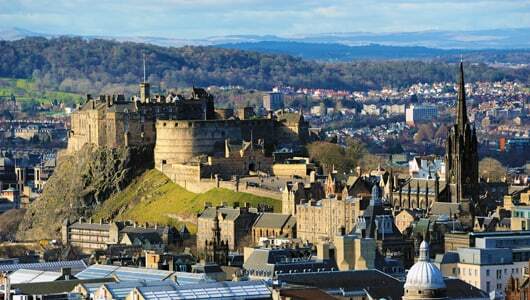 It really is no surprise that year on year, Edinburgh is short-listed amongst the worlds most beautiful cities. In 2015 Edinburgh was voted 4th most beautiful city behind Rome, Florence and Paris. Edinburgh’s Princes Street is around 1 mile long and is home to a list of top retailers. Shoppers will have the added luxury of walking along the shop filled street while having a remarkable view of the world famous Edinburgh Castle. If you’re in the area at 1pm then you’ll be lucky enough to hear Mons Meg. Mons is a cannon that was built in 1449 as a gift for King James II of Scotland. Throughout the year, Edinburgh plays host to a wide variety of different festivals and shows in various venues around the city. The Edinburgh Playhouse has hosted shows such as the Lion King, Saturday Night Fever and hundreds more over the years. During the month of August the Fringe Festival arrives and with it we welcome a flurry of talented performers hoping to get their careers of to the best possible start. Many comedians such as Rowan Atkinson (Mr. Bean), Sarah Millican, Lee Evans and Graham Norton got their break through the Fringe Festival. Taxis in Edinburgh: We’ve been taking people around Edinburgh in our taxis since 1925. We’ve been in the business a long time and appreciate everything that Edinburgh does to enhance the experience that the residents of the city as well as the tourists who come here to visit have. Booking taxis is straight forward, you can either call us on 0131 228 1211, book online via our WebBooker or by downloading our app which is available on iPhone and Android.